Salmon can grab any item or object that caught his eye. The reasons for such behavior can be different, you can start with the possibility of curiosity or aggression and continue to infinity. But it's undisputable that the specific salmon tends to react to artificial baits on the basis of their physiological state and behavior of the bait. Therefore, we can talk about the active \ passive fish and aggressive \ delicate bait. Here there are so many combinations and choices and as a rule, its so hard to choose. We can see the reaction of the active or passive fish to aggressive or delicate fly, given the nature of its movement in the water and the size \ color combination. 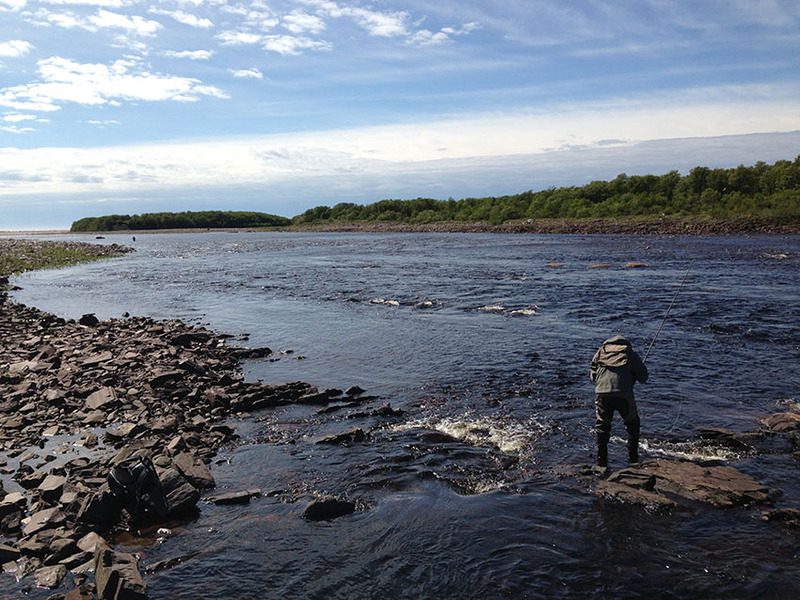 It seems logical to start atlantic salmon fishing in the spring with an aggressive techniques and tactics. We tend to believe that in moderately cold water active fish will aggressively respond to our flies. The high water level at this time also makes us to use large and heavy flies, which should show itself in a large volume of water. 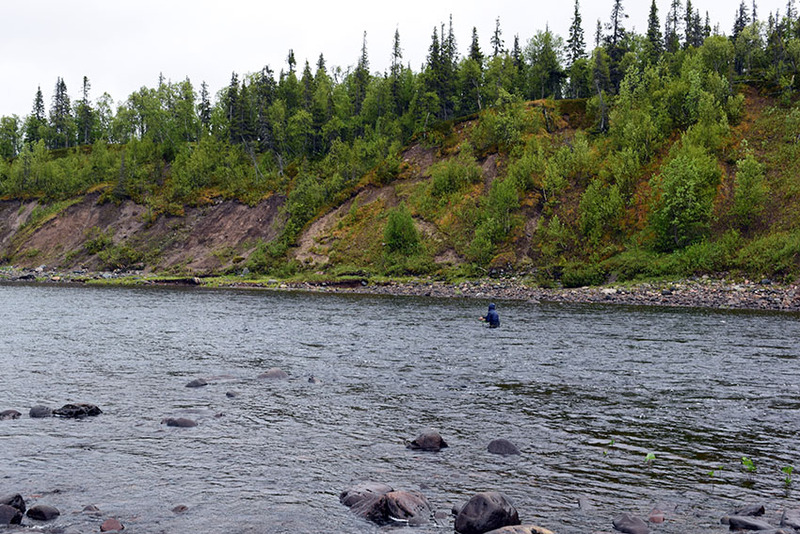 Casting a larger than normal angle to the flow and significant cross drift of a fly allow us to cover a large area, and to find position of the fish. It is also important to know the depth presentation of flies, because not all salmon tend to rise to the surface in a cold water conditions. Experimenting with the sinking lines\leaders and weighed flies can empirically find the best combination of our tackle for a specific location on the river. If we do not know exactly where the fish stays, then it is better to use a sinking line / leader and not too heavy fly. 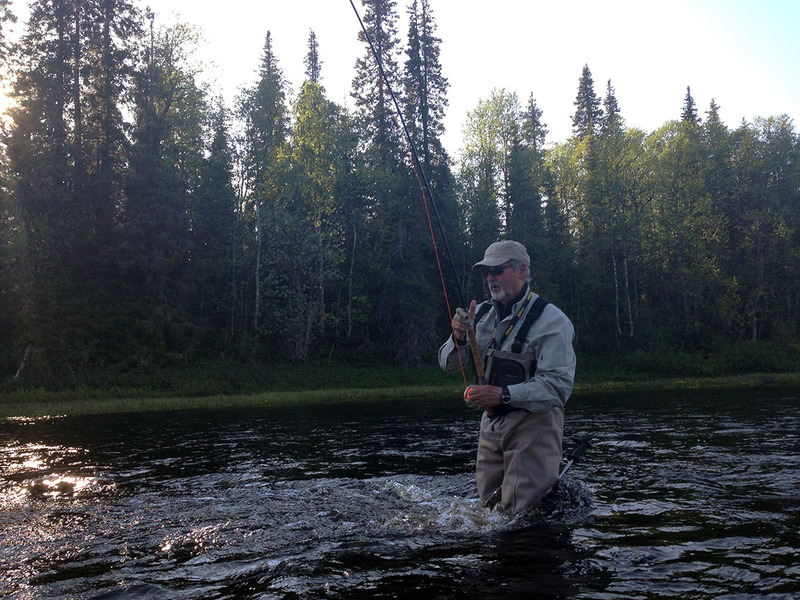 Casting at an angle of 40-60 degrees to the flow gives us a sufficiently rapid movement of the flies in a wide sector. If you know the location of salmon , you can narrow sector of casting, use heavy fly but reduce line\leader weight. It is important to understand how the fly moves after casting. Once I asked my experienced colleague - when your fly begins to work ? He said: immediately after casting. The correct position and perfect casting help us to put the fly in the working position as soon as it fall in the water. In the vast majority of cases salmon fishing technique is similar to the classical technique of fishing with wet flies. - the quality of fly presentation. Fly size \ color \ structure must correspond with its presentation. Fishing results depend on entirely simple factor - the time of proper fly job in the water. And the time depends on the perfect presentation of the fly, which is determined by your position in the river, which gives you an ability to manipulate your tackle correctly. Here below are a few excerpts from the discussion at the forum, which are relevant to the theme, which is affected in my note. What is the correct speed? Is there a correct speed when swinging flies for salmon? This I am sure has been discussed a great deal on here, but with the "Depth" thread live, I just wanted to ask if the speed varies for time of year/conditions or should it be varied at all times? In the spring, I am always trying to slow down a fly - makes sense in big cold water. However, on the Tweed a couple of weeks ago, we were trying to fish slow as well. It was biggish, perfect height i'd say, but not cold. Yet all the fish landed were caught stripping. A few fish were lost mid swing having taken yards of line (I have another theory on this fish). When I used to fish the Dee in September/October, most fish were caught stripping flies at all depths, the faster the better. So is there a "correct" speed for a given situation, or should I be trying all speeds as I fish down a pool - which is what i try to do. Maybe I'm wasting my time? I believe that if the depth is correct to present the fly in the taking window for given conditions and the fly size is correct for water clarity then there is no such thing as too fast provided the fly remains in the taking window for temperature and clarity. I use the example of all the fish taken on rapalas and spoons with their exaggerated actions. We're trying to illicit an aggression response not a feeding one so I believe movement is key. I'm convinced you loose far more opportunities for salmon fishing too slow rather than too fast. I don't really do cold water stuff much so I'll leave that to those that do, but from late spring to late autumn, keep your flies moving at a fair lick. Salmon are predators and you don't want to give them too long to see what your using. Mix it up big stylee! Indeed. He probably knows a thing of two about the game! I wonder how he'd have got on fishing the Tweed or Nith this back end!!!! Also I seem to find that the Findhorn and Spey like a faster fly than the Wye for example. I'm not sure he would be easily persuaded to try. Cold water fishing is definately a different job, and I have to say not my thing. I'm pretty sure slow not fast is going to be the go. I think around 11c is the point where they will take big falls, and that indicates it is the lowest temp for a "high speed" approach. I'm not sure how steep the downward curve is but I'd guess below 4 there not moving much. So I'd say 4 and below, as slow as you can, while you gently freeze, then speed up all the way to 11. Thanks for all the responses. I agree with all of them! Slow when cold, fast when warmer and with big flies, and vary it... I like fishing long winged Scandi style flies - I really think these fish best fast. A note from experience - I do seem to catch more sea trout than any of my pals while fishing for salmon, stripping big flies. But I think i fish a fly faster than they do. I think a great deal depends on the condition of the fish. I find that the fresh fish will likely take the fly fast, slow, across, down, whatever. If you have what are largely stale fish or at least reluctant takers, a fast cross current strip will often get one to take, and I've found that even in cool back-end conditions. In the summer when it gets really warm on the Miramichi very slow swings are more likely to be taken, dead-drifted dry flies even more so. I'll be very honest here,what ever most Salmon flies represent to our quarry I have no true idea(I can guess sometimes),but one thing is quite obvious,whatever the water temp and current speed the size of the fly one uses has to be capable of moving at the speed one is presenting it at. If I may illustrate,early Spring,lots of cold extra water,say a size 8 dressed flee in use,cast at the obligatory 45 deg. and left to fish in all honesty will be moving far too fast for most of the swing,it may well be that its not until its right into the slow water right in the edge that the flee looks natural. A 1 1/2" tube cast slightly squarer and again left,will look un natural for the early part of the swing,then look spot on for the greater part of the swing, before looking un natural again when it gets into the edge. A gurt big collie/monkey flee cast square will look ok almost straight off but all the while begin to loose its natural appeal the more it swings into ever slacker water.All the above is of course without any outside interference in the form of wading, mending or retrieve!. So if we begin to think about the size of the flee,the angle of cast to slow or speed its path(wading bit comes in there),mending to slow it or retrieving to speed it we can increase a flee's effectiveness for a greater part of the swing!. Of course,this is all a moot point as there's always things like depth to ruin everything,Salmon being Salmon and closely related to women will and often do completely unpredictable and very daft things!,then the worst of the lot is that you can't catch what isn't there!. I tend to look at the area of the river I expect fish to be in and work out how my flee will arrive there and roughly what speed it will need to be swimming at to look attractive to our quarry,then I'll pick a size of flee I think appropriate and give it a good go!. The Francis Grant book Salmon Fishing Dynamics explains it very well,but it will take some reading and practical experience to digest-its probably the best way to start,much better than my feeble attempts. So if I assume a 1 1/2"tube in the early season will look ok for the greater part of my swing when utilised with wading,mending,angle of cast etc,then I'll give it a go.If I see fish or suspect they're there and get no joy,I could fish a bigger flee squarer so it comes through faster and retrieve ever faster towards the dangle,or fish the same big flee slower and deeper by a longer shallower downstream cast and wade deeper(if poss. )and hover the flee over the fish more.I could also fish the small size 8 flee at the 45 deg. 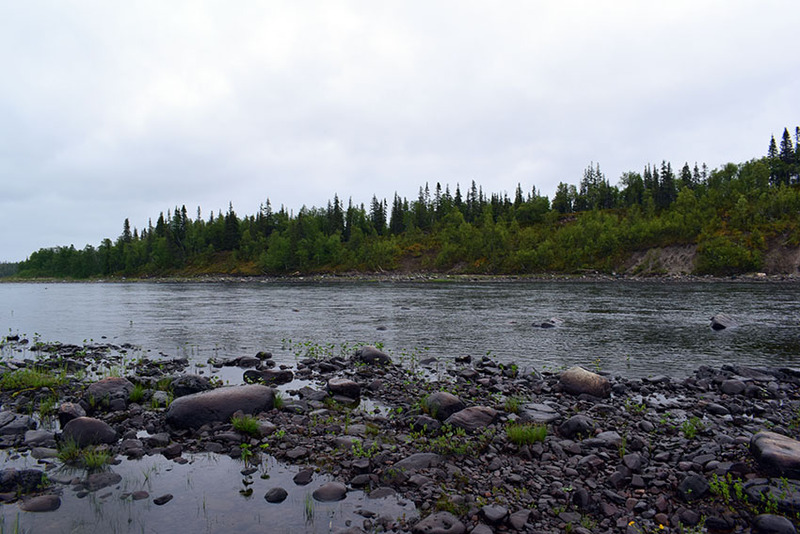 angle and allow it to be swept over and downstream of the fish as though its being carried away by the current,until it eventually gets to the steadier water where it will look natural as its able to hold station or even swim against the current almost right in the edge. As the water warms more throughout the year,the Salmons metabolism rises as does that of its prey,where you would have used a 1 1/2"tube you are now on the size 8 as it appears natural!,the bigger collie /monkey now looks un natural even cast square unless we impart a very very fast retrieve,we may even consider going smaller and fishing a tiny size 14 in the lowest summer flows and allowing it to hover in the creases and edges of the streams as it will look natural. If fish are your side of the river you may well be able to present a flee nice n careful n slow in the small sizes,or go medium and add a retrieve,if they're on the far side,you could go medium sized,throw in a mend,allow the flee to fish and retrieve towards centre/your side,or fish larger/longer -cast squarer so it comes round faster and retrieve,but that presentation may well be sacrificial to your side as it will look totally out of order. In my opinion the most important thing (obviously assuming there are actually salmon in the water you are fishing) is knowing your water. The better you know it the more rabbits you can pull from your hat. Cast well and get that fly PRECISELY placed and fully turned over and you are already ahead. Tons one can do to influence a fish with fly speed and depth. Some fish in some pools are more forgiving. Some are less. And in 15 minutes a new fish (or a stale one whose switch just flipped) may be there which is suicidal. There's so many variables in a river like flow speed, depth, rocks etc that is hard to give a definitive answer in mph. I find the most important thing is to keep in touch with the fly from the second it hits the water and give it life. I always have the line in my hand throughout the swing feeling for information about what's happening at the point. My retrieve speed can vary from zero to quite fast depending how I feel the fly is behaving at different points during the swing and I find a downstream mend will catch more fish than an upstream one.